"NYCHS Presents Miskell's 'Why Auburn?' -- the Relationship of the City and the Prison: Beginning"
John N. Miskell's Why Auburn? The claims of Cayuga County were presented in the Legislature by John H. Beach, then a member of the Assembly from this district who was undoubtedly the leading spirit in the lower house in 1816. He and other Auburnians worked hard to capture the state prison site and local citizens donated land beside the Owasco River on which it was built. The land, part of Lot #47, had once been a Cayuga Indian Village and during the War of 1812, it was used as a British prisoner-of -war camp. The State accepted the land because of available water power. A little more than six acres and 20 perches of land was conveyed by donors Samuel Dill, David Hyde, Ebenezer Beach, and John H. Beach to the State on June 22, 1816, along with the privilege of building a dam across the outlet and retaining half the water power. On June 28, 1816, the southeast cornerstone of the wall was laid. Auburn was in the prison business, and soon prospered. 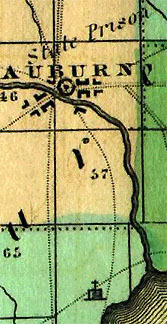 The words State Prison appear angled over Auburn in a detail from an 1829 Cayuga County map that appears on Bill Hecht's site, a treasure-trove of old maps, pictures, postcards, air photos, and geology info for Cayuga County and the Finger Lakes. 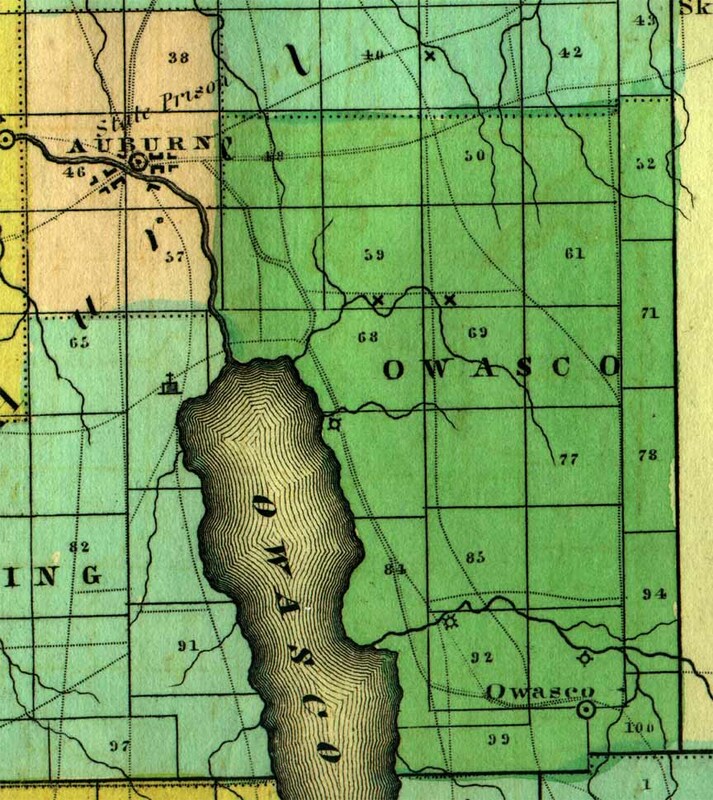 A line representing Owasco River marks the waterway's route from the Auburn area to Owasco Lake, only a small section of which is visible in the lower right corner of the map detail presented here. Harnessing the Owasco River's power via a dam project was a key factor in the selection of Auburn as the site for the state's second prison. Twenty thousand dollars were spent in the first season on the work, which employed not only every builder in Auburn, not otherwise engaged, but large numbers from abroad. The main building was enclosed and the outside wall raised to a height of four feet in 1816. By the winter of 1817 the south wing was ready to receive criminals. The work went rapidly forward after 53 men were sent from jails of adjacent counties to aid in the work of construction. Eighty-seven more men were received in 1818 for the same purpose. During the same year the State Commissioners on construction transferred the government of the prison to a local Board of Inspectors appointed by the Legislature. Auburnians were in control of the entire project. Work on the dam across the Owasco River was completed in 1819. The wooden workshops that used the water power developed from the dam were built in 1819-1820. Inmates set fire to the workshops in 1821. The shops were rebuilt almost immediately and inmates were punished for their actions. The work on the prison went rapidly forward until 1823 when the massive main hall and wings, extensive workshops and an enclosing wall twenty feet high high had been completed at a cost of $400,00, exclusive of the cost of convict labor. Its construction was a source of much of the prosperity of the village. The development of the American penal system then began at Auburn Prison. During the 1820s a system of prison administration arose that for a century wielded a strong influence upon prisons and reformatories throughout the world. The system previously established at Newgate Prison was hard labor and mild punishment. Food was not stinted and the work was not excessive; pay for overwork was generally allowed. Yet the system, although widely hailed at its inception, did not work. The institution had financial problems almost from the beginning. Formal sketch of NY's Newgate Prison. Discipline also soon became a problem as prisoners were often discontent. Throughout Newgate's history the usual punishment for infraction of prison rules was solitary confinement on shortened rations, usually bread and water with one full meal a day. The use of corporal inflictions was prohibited. In 1816 officials of the prison complained that the threat of ordinary punishments was insufficient to deter convicts from plotting arson or committing assault on staff. Insurrection was not uncommon in most prisons at the time and the convicts were rebellious, violated the prison rules at every opportunity, set fire to buildings and destroyed their work whenever they found they were not under observation. In June 1818 unrest among prisoners at Newgate culminated in a serious riot. The institution was literally threatened with total destruction. Military force had to be summoned before the violence was controlled. The State Legislature responded to such troubles and,in an Act of April, 1819, legalized flogging at both the Newgate and Auburn prisons. This was a highly significant enactment. It in effect constituted an admission by the lawmakers that the prison system was unworkable unless corporal punishment was superimposed on it. Although the Act of 1819 was clearly worded to guard against abuse, its provision of a limit of 39 lashes was not always scrupulously obeyed. For better or worse the New York system had acquired one of its most controversial features. Elam Lynds (sketch above) was a key figure both in developing what became known as the Auburn System and in exporting it beyond Auburn. He had begun his correction career as a staff member at Auburn prison when it opened in 1817 and rose to become its warden and then Sing Sing's. In fact, the original Sing Sing was built by a hundred inmates from Auburn. Shackled in irons, they were transported in 1825 by boat via the Erie Canal and the Hudson to the chosen site, an abandoned mine in a village whose name derived from the area's original native tribe, the Sint Sinck. Supervising the convicts' transport and their construction work was Warden Lynds. In effect, he made Sing Sing an "Auburn on the Hudson." Its proximity to New York City, the media capital of the world, resulted in the Westchester institution eventually surpassing Auburn in terms of name recognition among the general public. Elam Lynds, a lash wielding principal keeper who delighted in enforcing discipline. He was sadistic by nature. The South Wing or housing area was built between 1816-1819. It was put up according to the Newgate plan. It contained 28 rooms, each intended to house between 8 and 12 prisoners. There were an additional 61 cells, each destined for one convict or for two if necessary. Hampered by the conspicuous intermingling of convicts under the apartment plan which led to scheming and conniving, in 1819 the Legislature ordered the erection of an additional wing made up entirely of solitary cells. This North Wing, completed in 1821, became the model for most American prisons. Later on the South Wing was rebuilt on the same plan. Auburn Prison had produced a type of cellblock that found many imitators and influenced prison architecture for the next century. The silent system of Auburn Prison is perhaps one of the best known features of the early prison. The silence was not perfect. In 1845, for example, 173 convicts were whipped for talking or communicating, yet only a fraction of the offenders were actually caught. The system was designed to prevent the contamination of one prisoner by another. It provided for the separate confinement of each prisoner in silence in his individual cell at night and for congregate employment during the day in silent association with other convicts. Punishments for breaking the silence rule were swift and severe. However, the evening isolation, the lockstep marching plan, and the silent rule during the day were considered excellent by the prison reformers of the period.